According to a survey conducted by The Fournaise Group, 80% of CEOs say they do not trust marketers and are not impressed by much of the work they do. Why? Primarily because of a lack of focus. More than three-quarters (78%) of the CEOs surveyed say marketers often lose sight of their primary goal: to deliver quantifiably more customer demand for products and services. Not surprisingly, this frustration has led many CEOs to view marketing efforts skeptically and frequently disengage. In the past, this detachment might have been somewhat excusable. However, today it is absolutely essential for successful CEOs to care about marketing—especially digital marketing. CEOs have long struggled with marketing in large part because many tactics are hard to measure. Yes, it has always been possible to rigorously analyze some channels—such as direct response—but others have traditionally been fuzzier when it comes to determining effectiveness. Digital, of course, is different. Because of the straightforward connection between viewing and action, it is much easier to measure. 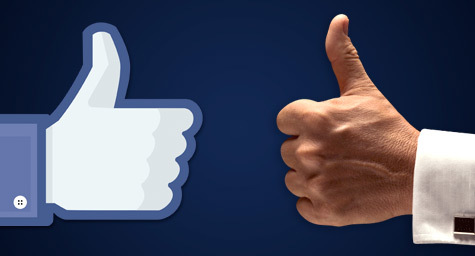 A key thing to note is that digital marketing measurement does not have to be superficial. Yes, you can easily see traffic data such as website visits and social media engagement, but the truly useful insights lie a bit deeper. The right analytics tools combined with a structured plan (i.e., one with set targets, KPIs, etc.) can give you essential, actionable metrics such as conversion rates, revenue per visit, average order value, and much more. Digital marketing gets a lot of press for its most visible channels, such as Facebook, YouTube, and even good old email. These platforms are absolutely key to any digital strategy, but they’re by no means everything. What is sometimes overlooked by CEOs is that there are digital tactics for every part of the sales funnel. The digital marketing toolkit is now amazingly diverse, encompassing everything from informative e-books to entertaining interactive tools. 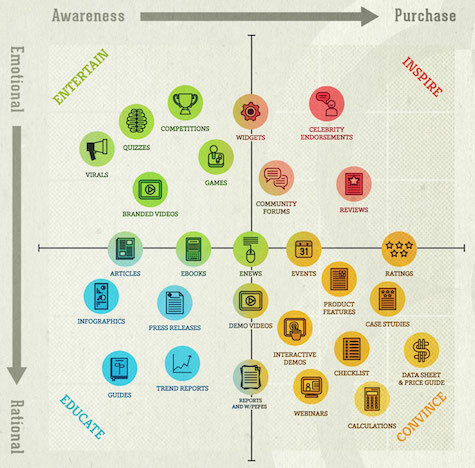 As the chart below from KISSmetrics shows, each of these tactics has its appropriate purpose. For CEOs this diversity of options is incredibly important because it allows for marketing spend to be tailored for specific goals, whether that means building awareness, nurturing leads, closing sales, or maintaining existing customer relationships. There was once a time when CEOs didn’t have to care too much about digital because the audiences were relatively small. That time is over. The migration from traditional mediums to digital platforms has been steadily occurring for a long time now—and rather than slowing, this trend has actually accelerated thanks to the huge increase in smartphone usage. 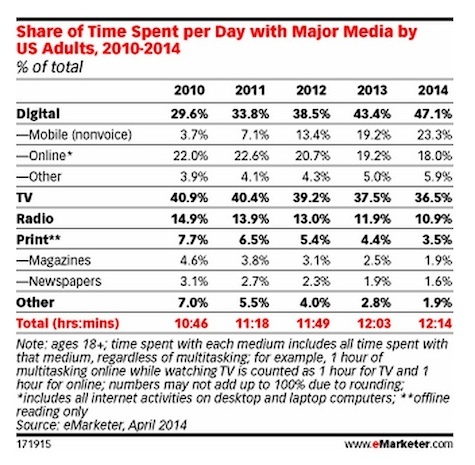 As the eMarketer table below shows, digital platforms account for nearly 50% of all time spent with media. Put another way, consumers now spend as much time engaging with digital channels as they do with TV, print, and radio combined. For CEOs this means that being digitally fluent isn’t just nice—it’s absolutely essential for reaching customers. Finally, CEOs should truly, deeply care about digital marketing for one simple reason: it’s effective. 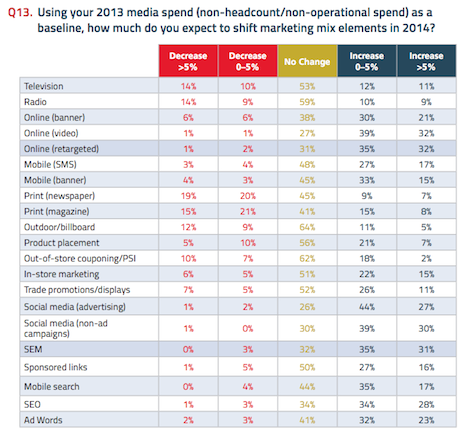 Recently the CMO Council asked members to identify which marketing channels they are increasing spend on this year, and which ones they are decreasing spend on. The top five areas of projected budget growth were: social advertising (71% of CMOs plan to increase spend), online video (71%), social engagement campaigns (69%), retargeting (67%), and SEM (66%). What’s interesting to note here is that the largest increases in spend aren’t going to the most cutting-edge channels (such as mobile). Instead, bigger budgets are going toward digital tactics that have been around for a few years (such as social, SEM, etc.). This indicates that CMOs are seeing real benefits from their current digital spends and are doubling down. Ultimately, CEOs need to care about digital marketing because it finally delivers what they’ve always dreamed of: a set of measurable, adaptable, tactics that effectively boost demand and drive sales. Discover effective digital marketing tactics that will increase demand and boost sales. Contact MDG Advertising today at 561-338-7797 or visit mdgadvertising.com.